Most, if not all pet owners, can tell stories of their dog’s adventures, when they have left them along for a few hours, or even a few minutes. These tales often involve shredding of valuable objects or furniture, scratching at doors and digging up plants. Pet parents can hardly believe how their lovable pooh who is well behaved when they are home, can cause so much destruction. With our dog, Jake, we had to “puppy proof” the entire house, otherwise he would get into trouble. Upon researching, we discovered that a crate could be an ideal solution to our dilemma. Stores such as Pet Smart carry crates in various styles and sizes so that can fit your dog’s needs and the design of your home. A crate should be large enough to allow the dog to stand up and turn around it. Crate training allows the dog to have a place where they feel safe in; this feeling of security will lead them to actually to enjoy spending time in it. Travel carriers allow you to easily travel with your pet and have a safe spot for them wherever you are. 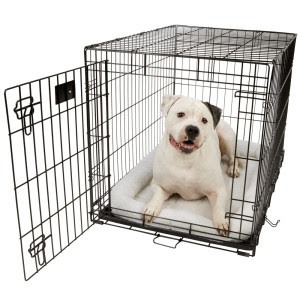 There are various crate liners that are available which can make a crate a comfortable cozy nook for your dog. Once your dog is used to the crate it makes life just so much easier as you don’t have to worry about the state of your house or that your pet may have consumed something harmful when you were gone. Yep. Definitely could tell you about the bottom of my couch ripped to shreds. Wished I would've done a better job with the crate training. Great article. Good to know Pet Smart does this. Nice Blog and a good article too, thanks for posting.